A new study has revealed which bird and bat species are most at risk of collision with wind turbines, with birds of prey and migratory birds coming top of the list. This research is the first to take a global view of the problem, and pinpoints some possible solutions to allow birds, bats and wind turbines to share the skies with less conflict. A main concern with wind farm development is the risk of birds and bats colliding with turbines; the giant revolving blades not only capture the power of the wind, but can also catch out unsuspecting wildlife, leading to fatal collisions. This problem has been well documented in Europe and North America, however until now much less was known about the situation in other parts of the world where wind power is rapidly expanding. For the first time, a global view of the situation has been revealed in a recent study published in Proceedings Of The Royal Society B, which has modelled rates of collision for various bird and bat species in relation to factors such as their migratory behaviour and ecology, as well as wind turbine height and capacity. This important work was led by the BTO and supported by BirdLife International, the International Union for Conservation of Nature, the Royal Society for the Protection of Birds, the United Nations Environment’s World Conservation Monitoring Centre, and the University of Cambridge. 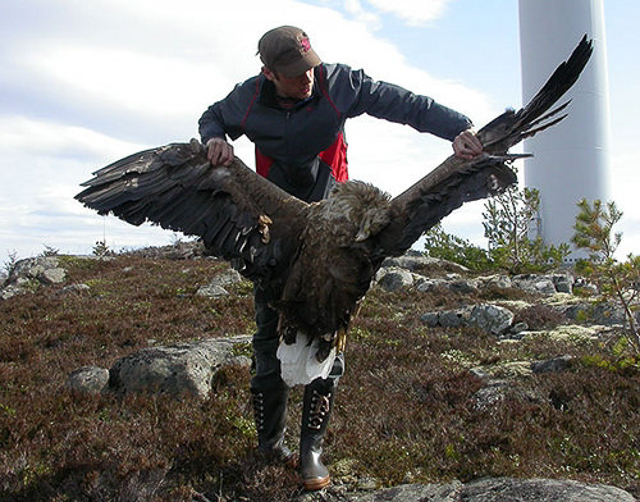 The most vulnerable species were found to be birds of prey, especially the White-tailed Sea-eagle Haliaeetus albicilla, Golden Eagle Aquila chrysaetos and Griffon Vulture Gyps fulvus – partly due to the fact that they often use artificial habitats such as farmland for their hunting, which is where onshore wind farms are most often placed. A recent Nature article suggests that the high collision rates for raptors could also be due to their visual adaptions for hunting; they have a large blind spot directly in front of them which means that a wind turbine can catch them completely out of the blue. The high vulnerability of birds of prey is especially problematic as many such species are slow to reproduce, meaning that the loss of breeding adults in fatal collisions has a much greater effect on the population than on many other species. 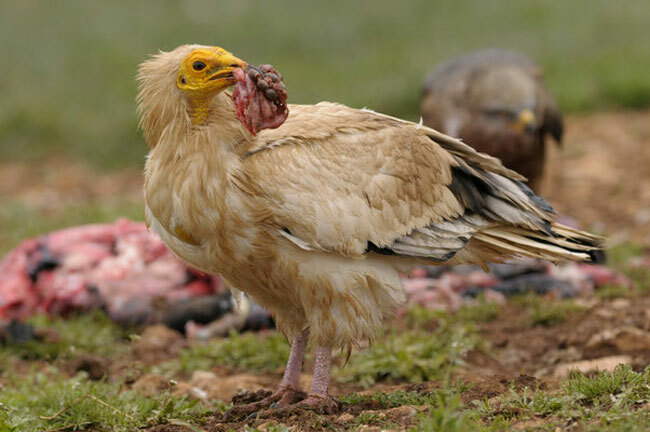 Added to this, many birds of prey are already globally threatened, especially African and Eurasian vultures, so windfarms in the habitats of these birds have the potential to worsen an already drastic situation for the survival of these species. Migratory birds were also found to be highly exposed to the risk of collision, especially where wind farms are placed in important flyways; coastal and migratory pathways have the greatest numbers of vulnerable bird species, such as the Central American isthmus from Mexico to Panama and the Rift Valley of East Africa. For bats, the highest numbers of collisions were predicted in North America, with several species such as the Hoary Bat Lasiurus cinereus and Eastern Red Bat Lasiurus borealis particularly vulnerable. Alongside highlighting the importance of choosing the right location for windfarms (such as avoiding important migration routes), the paper suggests that building fewer, larger turbines can help to reduce the risk of fatal collisions. By informing the design and location of future projects, research such as this helps to soften the tensions between wind farms and birds so the benefits of generating renewable energy can be enjoyed and celebrated whilst minimising the effect on wildlife. Surely this report totally contradicts the March 2017 review which looked at ”the role of satellite tracking technology in monitoring the movements of young Golden Eagles”? ”The report found no link between the fitting of tags and the disappearance of the birds wearing them, ruling out any connection with wind turbines and undermining suggestions that the failure of the tags (due to loss of signal or breakage) was responsible for the tagged birds disappearing”.